The complexity of the various CGG-containing alleles, the variable severity of disease manifestations, and the marked heterogeneity of clinical presentation in carriers are hallmarks of fragile X syndrome. As the risk of reoccurrence is high in the family and carrier relatives, accurate diagnosis of at-risk individuals, even before classic signs of disease manifest, is important. Accurate methods to measure CGG repeat length, and reference materials to distinguish alleles within the different size categories, are important for diagnosis and counseling of affected families. 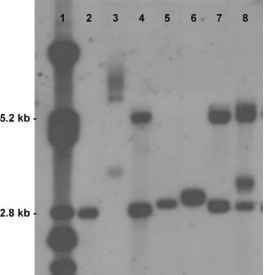 Although CE measurements had better precision than slab-gel measurements, anomalous rapid electrophoretic mobility of repeats occurs in proprietary gels. Hence NIST has developed a control material consisting of an allelic DNA ladder to enable accurate size determinations across platforms. This material, SRM 2399, will be released in late 2004.